A logo rumored to be for Google’s upcoming streaming service on display outside the Game Developers Conference 2019 in San Francisco, March 18, 2019. A Google exhibit at the Game Developers Conference in San Francisco on Monday appears to be teasing some sort of hardware related to its widely rumored video game streaming service, albeit with a logo that looks like Doritos and the wifi symbol had a monstrous love child. 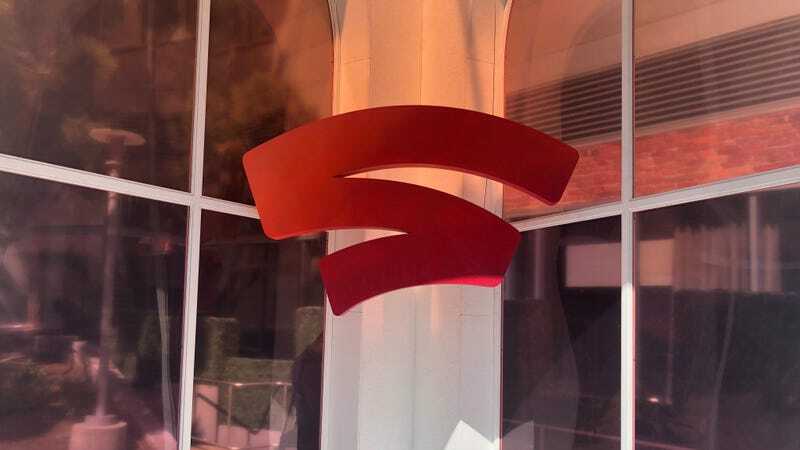 A Google representative on site confirmed to Gizmodo that the logo is related to a major event tomorrow where the company will announce its “vision for the future of gaming,” and which Variety reports is suspected to be some sort of streaming hardware for video games. As Variety noted, Google has been testing a Project Stream service that beams Assassin’s Creed: Odyssey to users without an installation requirement since last year, and the magazine found that the company has filed patents that appeared to be related to streaming game controllers. Variety also found that code already running on Chromecast devices includes snippets referencing game-streaming integration. A Google retrospective exhibit on the history of gaming (as well as an empty case labeled ‘Coming Soon’) on display outside the Game Developers Conference in San Francisco on March 18, 2019. According to Gizmodo’s sister site Kotaku, various theoretical features floating around in the rumor mill include compatibility across a broad array of devices, Twitch and YouTube integration, and other bells and whistles. As for that appalling logo? Could be worse, I guess. Does a Spider-Man Superfan Know NYC Better Than a Local?